Composed by Clifton Chenier. Edited by Gary Dahl. Saddle-stitched, Piano Accordion, Cajun / Zydeco, Style, American Music. Arhoolie. Cajun-Zydeco. Book. 36 pages. Mel Bay Publications, Inc #96616. Published by Mel Bay Publications, Inc (MB.96616). ISBN 9780786628384. 8.75 x 11.75 inches. Transcribed by Gary Dahl. 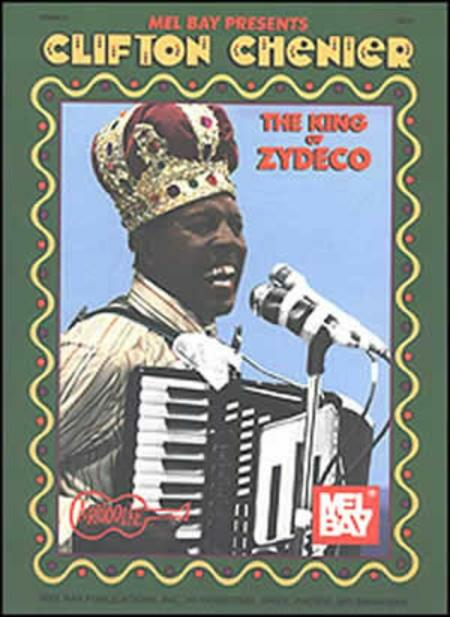 This collection of 15 accordion arrangements of tunes by Clifton Chenier (1925-1987) clearly demonstrates why he is known as the undisputed King of Zydeco music. Written for the piano accordion as opposed to the Cajun button accordion, all of the selections in this book are transcribed from Chenier's 1965-1987 recordings on Arhoolie Records. The featured tunes are: Ain't No Need of Cryin'; Tu le Ton Son Ton; I'm Coming Home; Jole Blonde; Calinda; Louisiana Two Step; Ay, Ai, Ai; Louisiana Blues; Black Gal; Big Momou; I'm on the Wonder; Zydeco Cha Cha; I'm a Hog for You; Zydeco et Pas Sale; and Black Snake Blues. Dix Bruce contributes a fine essay on the colorful life of Clifton Chenier. A delightful companion CD recording is available in the spirit of Chenier's signature cry- Laissez les bon ton roulet! (Let the good times role!) *** Note: 10 songs out of 15 are on the cd, 96616CD Clifton Chenier 60 Minutes with the King of Zydeco. The other 5 songs are transcribed from other Arhooolie CDs by Clifton Chenier. The book does not contain song's text. I'm from Italy and for me the text is very important. These lyrics are not in the web. I's a pity. If I knew I'd not bought the book. I had never played Zydeco music. These arrangements have a real Cajun sound and are fun to play. The blues numbers are great. The arrangements are full enough to be performed as a solo. August 16, 2004 Great Zydeco transcription from Dahl. too. Zydeco Cha Cha rocks and is one of the easier tunes to start with. 34 of 58 people found this review helpful.